MREs (short for “meals ready to eat”) are the brainchild of the US Military. These convenient, ultra-durable, and super compact meals were developed by the military to replace the heavy, bulky rations that preceded them. Earlier military meals required much more time and resources to prepare and because of their weight and bulk they also required more effort to move. Early rations also left behind a good deal of waste – a clue to the location and movement and number of troops. MRE foods was introduced in the 1980s as a way to improve military efficiency as well as boost morale and add nutritional value to military rations. Modern day MRE meals are individually packaged, complete meals that contain all the calories needed to feed one active person. MREs are incredibly compact, lightweight, and durable making them easy to carry and to store. An MRE is a complete meal for one person. The meal is entirely self-contained in a small, durable package. Each MRE contains about 1,250 calories as well as the necessary vitamins and minerals to be a balanced meal. MREs can be eaten as the sole source of sustenance or can be used in conjunction with other emergency food supplies like freeze-dried or canned foods. MREs are not freeze-dried nor dehydrated; therefore they can be eaten directly out of the packaging with no preparation whatsoever. While MREs are designed to be edible directly out of the packaging, they are much more enjoyable when warmed up. Unlike most other survival foods, MREs do not require water for reconstitution, cooking, or heating. Rather, these fully cooked meals come complete with a single-use flameless heater that will heat the meal quickly without the use of precious fuel. MRE meals are packaged individually. Each meal is fully cooked and sealed in an aluminum foil and plastic pouch. These pouches are then heated for sterilization purposes. These individually sealed pouches keep oxygen from reaching the food, which keeps it from spoiling. The shelf life of an MRE is specifically dependent on the temperature at which it is stored. Keeping your MREs at a steady temperature is the best way to ensure their shelf life. Temperature variations have been shown to cause degradation and decreased shelf life. Military MREs were designed to keep without spoilage for 3 years at 80°F. Storing your MREs at lower temperatures will increase the shelf life to up to 5 years, however MREs should not be frozen as a storage technique. While MRE meals can withstand freezing, they lose their long-term storage capability once thawed and must be consumed. Why Are MREs Great Survival Food? Since MREs have been designed to withstand rough handling they’re perfect for an emergency kit or bug out bag. Each MRE weighs between 18 and 26 ounces so they’re nice and easy to carry. In an emergency or disaster situation water may be of questionable quality or completely unavailable. An MRE requires no water for preparation so they are ideal when water conservation is prudent. MREs don’t require fuel for preparation since they include a single use flameless ration heater. This means you can save your fuel or choose not to carry large amounts in your pack or emergency kit. 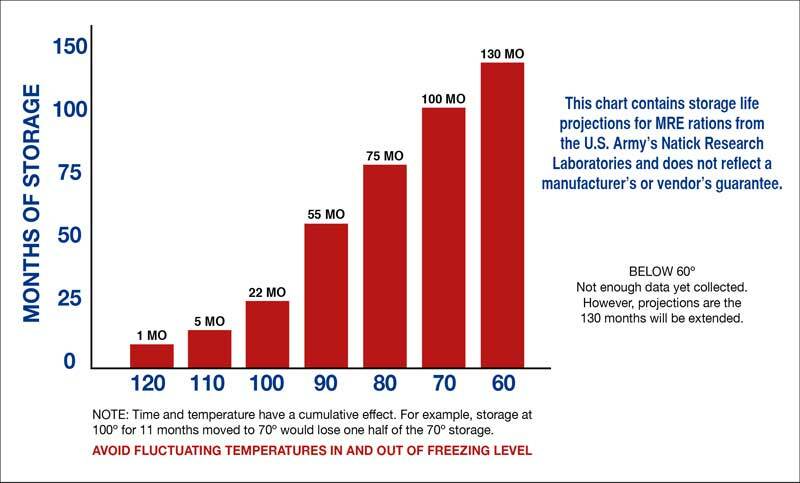 MREs have a reasonably long 5-year shelf life when stored at or below 60°F. The shelf life decreases in relation to higher storage temperatures. MREs are complete meals with average calorie counts around 1,200 per meal. In an emergency situation a conveniently pre-packaged balanced meal may be much easier than figuring out each component.